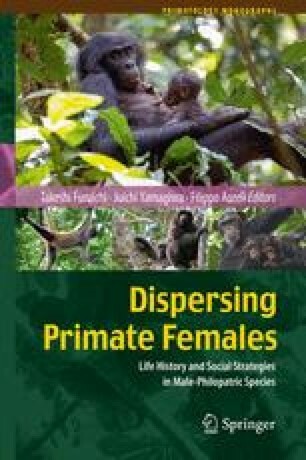 Although gorillas live in a wide range of habitats with varying degrees of frugivory, all of their populations exhibit female dispersal that characterizes many non-female-bonded social groups of folivores. Natal dispersal is common for gorillas, but inbreeding avoidance did not seem to explain which females transferred among the Virunga mountain gorillas. Analyses of secondary transfers gave no indication that feeding competition limits the group size of western gorillas or mountain gorillas, although group size appears to be more constrained in western gorillas. As a result, western gorillas may be an example of the original folivore paradox: if the costs of feeding competition are insignificant, then why are females remaining in smaller groups, despite predictions of higher predation risks? Mountain gorillas no longer have natural predators, but they may be an example of a second folivore paradox: why do 50–60 % of females live in smaller one-male groups, despite a higher risk of infanticide? Transfers by female mountain gorillas did not show a consistent preference for multimale groups. A mathematical model and empirical results from western gorillas suggest that variability in male quality may resolve both paradoxes. In addition, the influence of infanticide may vary considerably among gorilla populations. Preliminary analyses showed little evidence of any cost of dispersal by mountain gorillas in the Virungas. The lack of such costs may help to explain why dispersal is common among gorilla populations, even if the benefits are not yet fully apparent. We thank the many NGOs and governments for collaborating with us on various projects related to this book chapter. We thank Takeshi Furuichi, Juichi Yamagiwa, Filipo Aureli, and anonymous reviewers for their helpful comments. This project was funded by the Max Planck Society.